I finished this last week, but I misplaced my memory card for my camera so I couldn't take any pictures. Boy is that annoying! Those slippery little things can get away from you so easily! Here is the 5th month, The Maypole. The picture came out a bit dark and out of focus, but here it is! 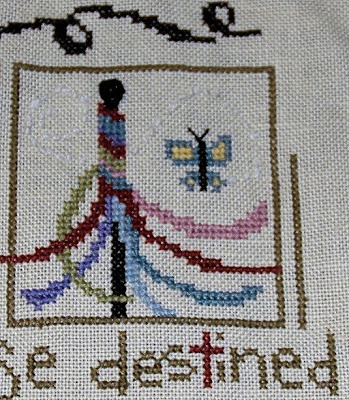 It is hard to see, but the little white dots from the butterfly are French knots. I am still not sure about these colors. I think I would have chosen different ones, but I am going to wait and see how it looks when it is finished. Progress on "In the Forest"